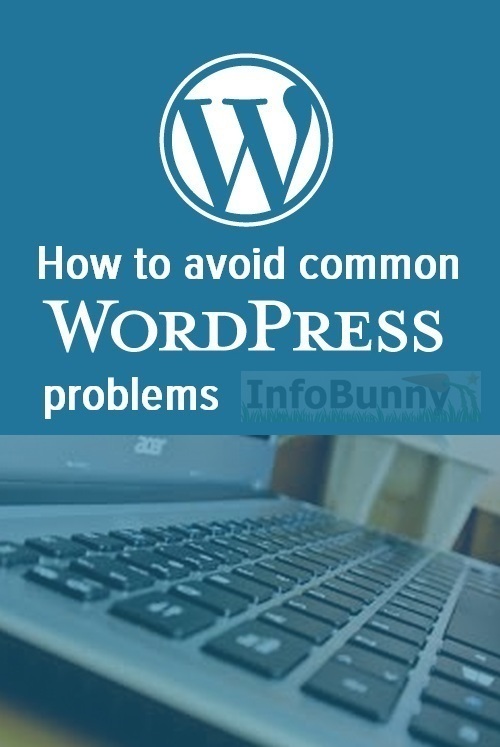 How to avoid WordPress problems as they arise? WordPress is no doubt the best and most versatile publishing and blogging platform. Or at least that is my opinion. 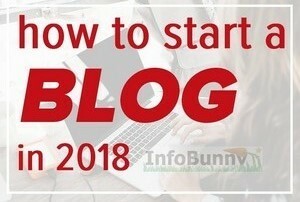 If you are thinking of starting a blog and you asked me how to get started and which way to go then I would give you all the options available but always push you to go the WordPress.org way, the self-hosted way. However, with the brilliance of WordPress comes with some very annoying WordPress problems. Quirky things that you need to know about. The reason why every WordPress blogger loves WordPress is that WP it is just so customizable and versatile. There is not much that you can’t really do with it. However, there are some issues that can arise with WordPress that can be problematic. When you start a blog with a fresh WP install you have quite a set up ahead of you making it into something visitors will like. WordPress comes with 2 or 3 themes that are built into the install. So you may think “great I am good to go”, but the first thing you need to do is to Google something like “free WordPress Themes” Why? Well because you don’t want your blog to look like every other bad blog using the default install themes. You will find that there are thousands and thousands of free themes available. 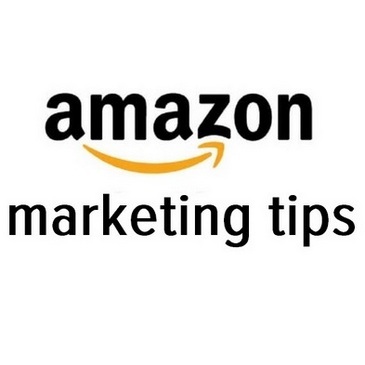 You will get to see demo sites showing you how they work and what they look like and this gives you an idea of what your site could look like going forward. So by doing a quick search you are not only finding a better theme you can use to make a better WordPress site you are also doing some great brainstorming that gives you examples of how your site or blog can look.. 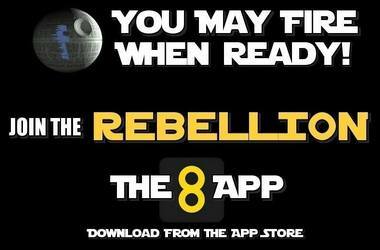 Unfortunately, with free themes, there is a But. Free themes are fine but they can cause some avoidable WordPress problems going forward. 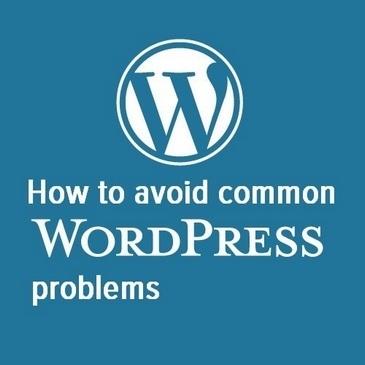 Here are a few of the common WordPress problems and issues that arise with free themes. 2/ Free WordPress themes are not updated as often as they should be which can cause security issues and compatibility issues with plugins. 4/ Support for problems and issues tends to be very slow or even non existent. So if you want a faster and more secure site then I would recommend going for a Premium Theme especially as they don’t really cost that much. WordPress is constantly being updated to make the overall platform better and to fix new security issues and problems that arise. With a new update comes the problem of potential conflicts between WordPress and the plugins that you have installed. You often find that shortly after a WordPress update you start to get admin messages within WP telling you that there is a new version of this plugin or that plugin. Although it is a very good idea to keep your plugins updated it is good to note that newly updated plugins can still cause issues on your site. The good news is that when problems arise like this they tend to be fixed very quickly with a new update that is rushed out. Only install plugins that have 10s of thousands of users. If a problem arises with a popular plugin it gets fixed fast as there are so many users reporting the issues. If you are using a plugin that is not widely used then it could take some considerable time for any issues to be resolved. This can be a slow and very annoying fix as you have to basically troubleshoot each plugin. Go to the most recently updated plugin and disable it on your plugins page. Then in a new browser tab visit your blog and see if the error is fixed. Hopefully, the WordPress problem you have is caused by a new plugin update. If that is the case keep the plugin disabled and wait for a working update. If you still have a problem then you will have to go through each plugin disabling and then refreshing your blog to see if the problem resolves. You can’t avoid WordPress problems caused by plugins because we need plugins for functionality and customization. But by limiting the number of plugins that you use and using the most popular plugins you do limit the number of potential issues. If a plugin is causing a significant problem and it is one that you really really need then it would be good to talk with the Plugin developers I ould even consider buying the premium version if it meant that I was part of a fast-track support group or forum to get fixes more quickly. You will also be able to get support from your theme developer if you have paid for a premium theme. You will also find that you can get premium plugins bundled in with theme purchases. It’s time to address a potentially massive WordPress problem that really is avoidable. 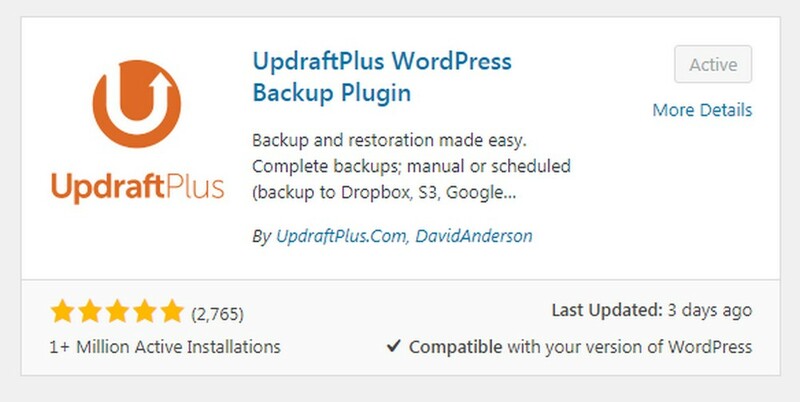 WordPress comes with no built-in backup facility. And if you are not backing up your site then you are walking a dangerous line. Chances are you will never need a backup but it is something that you must have in reserve. Some hosting companies will back up for you but I still urge you to go through the process and make your own backup. Wordfence is one of those plugins that you really can’t do without. 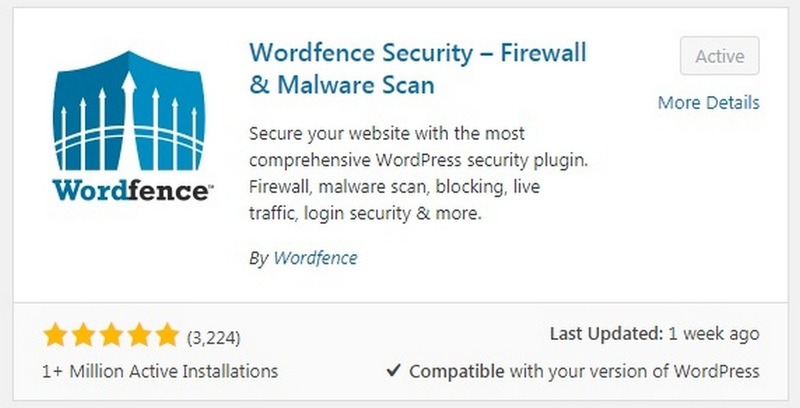 Wordfence covers everything you need on the security side of your site and also has a handy notification feature. 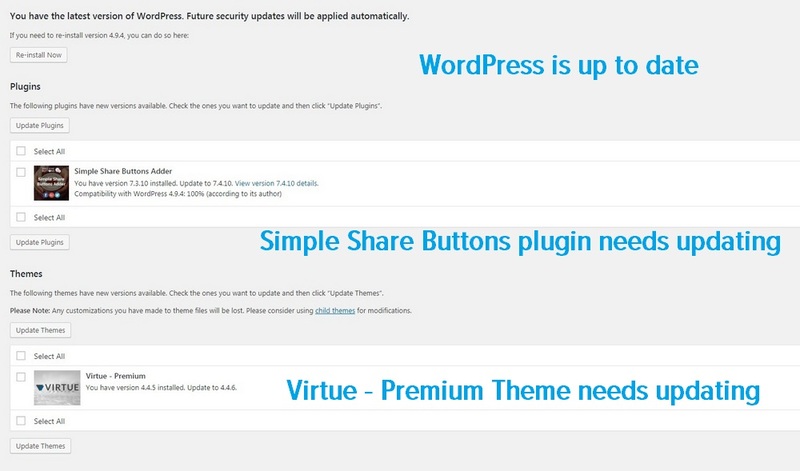 Without Wordfence you never know if a plugin needs updating unless you are in admin mode within WordPress. But with Wordfence when you add your email to the plugin you are emailed when any of your plugins need to be updated helping you to avoid problems. You then also get the heads up on any security issues that are affecting WordPress users around the world helping your site to stay problem free. Take a look at the screen capture of my admin side of Infobunny. What do I do when I get annoying WordPress errors like “error 500”? Well, I head straight over to Google because life is too short to have the answers to these server and site problems. 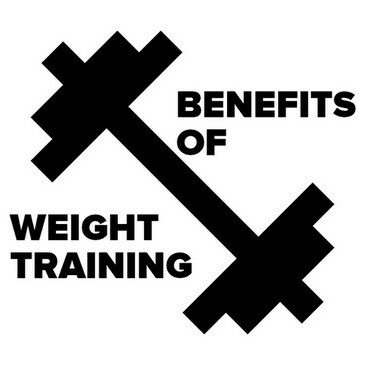 I just look for good resources and follow the step by step process. 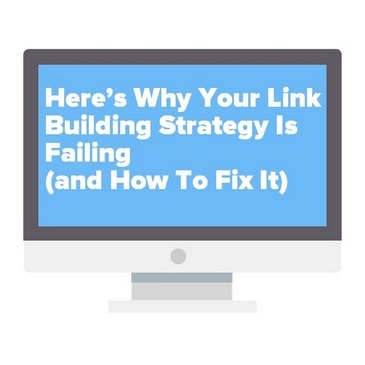 So in this section of the blog I’m not going to show you how to fix these types of issues because I don’t know I’m just going to give you a simplistic understanding and then help you out by just linking you to the best resource I have found that will fix your given WordPress problem. This is a really annoying WordPress problem to have because WP doesn’t even know what the problem is itself. The Internal server error is one of the most common WordPress errors that you will come across It is annoyingly frustrating as the error message does not indicate where you should start to look for a solution it is pretty much up to you to figure this out with an extensive troubleshooting session. Whenever I have had this error the one place that I start to look for a fix is my plugins. You just need to go through them and deactivate and then refresh the page to see if any of the plugins are the problem. Hopefully, it is a plugin problem because that is the easy fix. If not you have to look outside my pay grade at your .htaccess File to see if that is corrupted or Increasing the PHP Memory Limit and there are a few other things that you need to check if this annoying WordPress problem persists. This is one of the main WordPress problems that you really want to avoid. As you gain confidence in using WordPress start to look at making everything run better, you tinker with it, or at least I do. And sometimes when you tinker you mess things up a bit giving you a Syntax error. I had this issue recently and although it sounds like quite a complicated problem it is not if you think about what you are doing and just cover a few bases before you play with your files. So let me explain why I was editing the files on my site first of all. I have a bbPress forum on Infobunny. bbPress is a WordPress plugin that you can install and hey presto you have a whole forum system added to your site. WordPress comes with a basic code and visual editor when you install so one of the first plugins I always add when I create any new site is the TinyMCE plugin to give me tons more editing functionality. 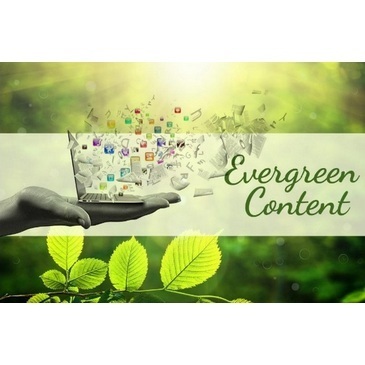 It sounds to the newbie that it could be over complicating the content creation process but in fact, it makes it easier because it takes you away from the more basic code based side. Well anyway, bbPress comes with only a code based editor for creating forum posts so unless you know html code you are limited to only posting text. 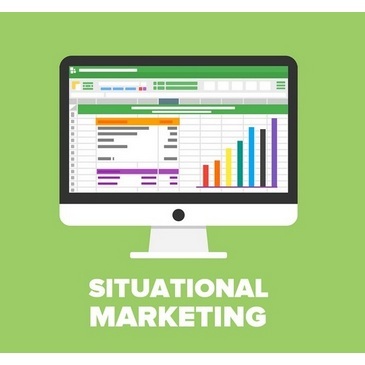 I’m always thinking about the optimization side of the content I create for SEO reasons so I want to be able to create forum posts that can look and feel more like blog posts. So I started looking for a solution to upgrade the forum post editor to the same as the TinyMCE editor that I have to make it easy to create forum posts. The fix that I found was to add a single line of code into one of the files. This can be very dangerous because if you make a mistake you are more than likely need to go back to the c-panel on your hosting account and look through endless files to find the change you made to then correct it. I have done this and believe me you don’t want to be looking through those files. 8/ Repeat the above steps if you want to try again. If you edit your file without the above safety measure and you do end up with a Syntax Error then you can again lean on WPBeginner, they have you covered with How to fix the syntax error. The good news with the 403 error is that we know exactly what it is. The message is the result of a problem with permissions on your site. That means there’s something preventing you from accessing files you should usually be able to interact with. Unlike the Error 500 message 403 access forbidden is relatively easy to fix. 1/ When you’re trying to access your dashboard or login page. 2/ While you’re installing WordPress. 3/ While trying to access any page on your website. You will by now probably not be surprised that the 403 error can be caused by a plugin. That is where I would start to look for a fix first. If deactivating plugins does not work then you need to dig deeper into looking for a .htcaccess file issue or that possibly someone has changed site permissions. Usually, the Database Connection error occurs when a user has entered or modified their database credentials (database host, database username, and database password) incorrectly. Sometimes your database server could be unresponsive, or your database may have corrupted. However, mostly it is incorrect database login credentials. Our friends at Design Bombs have you covered with their How to Fix Error Establishing a Database Connection Error. The White Screen Of Death is exactly what it sounds like, it’s just a white screen. Most of the time it is caused when a script exhausts PHP memory limit. It can also happen due to a configuration on the server. It is also possible that a user would only see white screen of death on certain sections of their site. The majority of the time when you see a white screen of death, it means that you exhausted the memory limit. No surprises here that this WordPress problem could be caused by a plugin that you may be using that is not functioning properly. It could also be caused by a poorly coded theme, (another reason to buy a premium theme) that you are using. It could also mean that there is an issue with your web hosting server. So if the plugins trick fails to work then I suggest you go back to WPBeginner and read their How to Fix the WordPress White Screen of Death article. As you can tell by now, WordPress plugins are both a blessing and a curse. They allow you to add style and functionality to your WordPress. The level of customization and functionality that you can add makes the risk of the potential WordPress problems that you can encounter worthwhile. Any WordPress problems you do come across are usually user-generated or just a conflict between your plugins. You can avoid many of these problems if you limit the number of plugins that you install and you only install the most popular plugins. They are popular for a reason, mainly because they tend to work and are reliable. 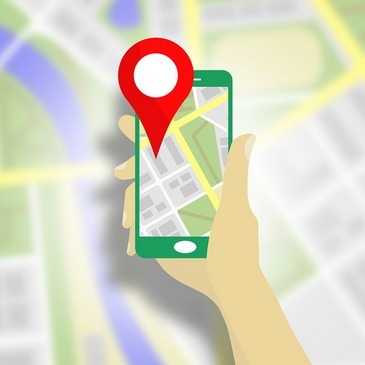 Should you run into any problems due to incompatibility problems you tend to get a quick resolution because there is always an awful lot of users of the plugin in question reporting the issue. Have you encountered any of these faults? How do you avoid WordPress problems? Ahh! You’re so right. 99% of the time it’s a plug-in that has caused my issues. I *painfully* learned that updating 7 at one time, really wasn’t a great idea. I got the 500 error, and nothing I could do could fix it. Thankfully my hosting site had free support, so I was able to get into their chat and beg for help. It ended up being a bad version of WooCommerce that needed another plugin updated before it could be. #soannoying Now I dutifully update plugins one or two at a time every single day; I really don’t want that to ever happen again. 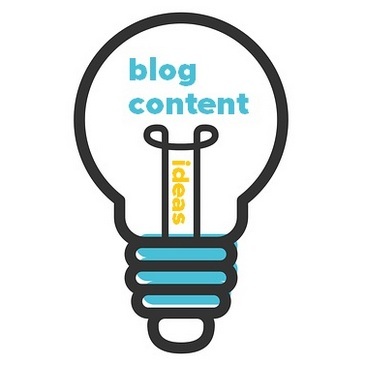 As a newer blogger, I was glad to see that using Wordfence and Updraft were recommended by you. Wordfence helped me see that I was being hacked by someone in Mexico and I was able to shut that down pretty quick by deleting the general ‘admin’ login and using more complicated passwords. Hi Dexter very informative article! I’ve learn’t the hard way – fixing them myself usually by going through my site files and renaming plugins until I have a working site. As Joanna mentioned updating much more than 1 – 2 plugins at a time isn’t a good idea learn’t that not long ago. Good advice on keeping WordPress and it’s plugins and themes regularly updated – had to rebuild a few sites nearly from scratch due to being outdated versions! Since I’m somewhat familiar with a few computer languages I’m also fortunate enough to be able to edit many of the files themselves to resolve issues – painful process though. I’ve only encountered very minor problems with my WordPress blog since 2009. Then again, I am very tech savvy and would welcome problems. I do a lot of these so it’s good to know I take the appropriate steps when something goes wrong. The problem is– a long time ago the Jetpack update broke my blog and I had to outsource since I didn’t know how to go to an older version of the blog to fix the problem. Now, I’m reluctant to update Jetpack. I stumbled your post. hello .. very nicely explained . 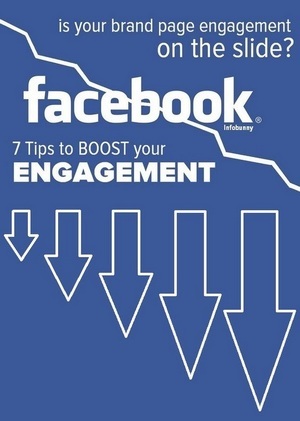 Very informative post ..
Hi Kyla, if you interested in a writing spot on Infobunny just let me know. Thanks for stopping by and commenting. Good advice with themes. I once installed a free theme which was not getting updated and eventually wordpress started spitting out errors which led me to change theme. thats the danger, there is little reason for developers to stay on top of a free themes security etc as it doesn’t pay the bills. You explain everything briefly and step by step. I like your guidance about plugins. Your all work is really appreciated. Can you guide me about free theme for my website? Your opinion is very helpful for me and appreciated. Hi thanks for stopping by. I see we are i the same niche, would you be interested in writing for us?